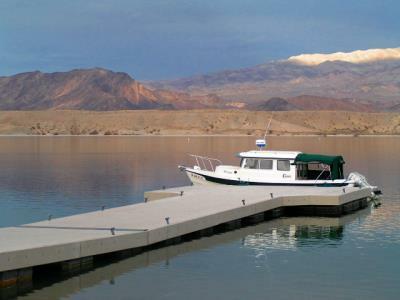 Launch: Cottonwood Cove, east of Searchlight, NV, for a delightful, quiet, family-oriented marina. 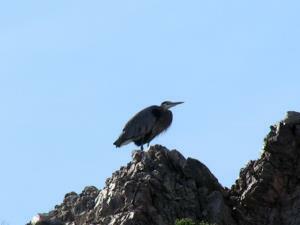 Katherine Landing, AZ, near Laughlin, is closer to the buffets and casinos of Launghlin. Nearby campsites: Both marinas have RV camping, restaurants, and boat stores. Comments: This lake is a hidden treasure. 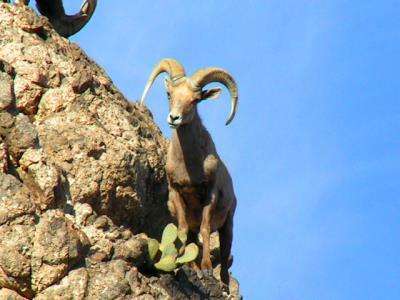 There are many coves, beaches, narrow canyons, wildlife (watch for the Desert Bighorn, and you're sure to hear the coyotes), and desert scenary. 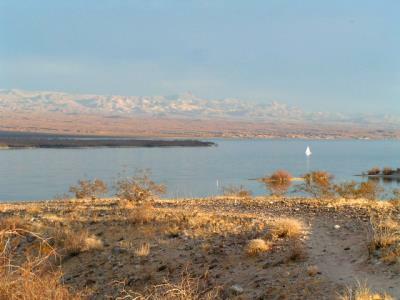 Lake Mojave is an incongruity - blue, sparkling water in one of the driest regions of the continent. The waters of the Colorado derive from rain and snow melt in the high mountains of Wyoming, Utah, and Colorado. The river works its way through the canyon lands and finally reaches the sere, brown treeless landscape of Arizona and Nevada. 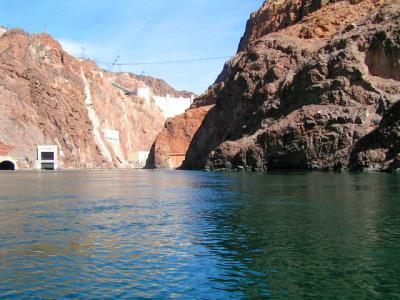 The drought lands of these two states, even before human water withdrawals, demand more water from the river than they give - the evaporation off Lake Mead is greater than Nevada's total legal water allotment. 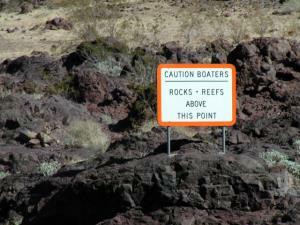 And yet we go boating on clear, blue shimmering water in the middle of the Great American Desert. 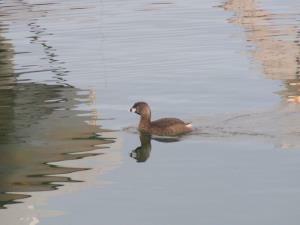 And that's only one of the contrasts that make Lake Mojave such a joy for cruising. 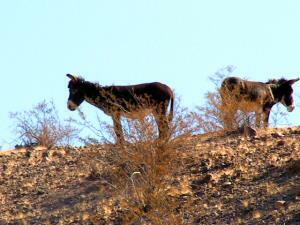 Here one can spy a mountain lion or a bighorn sheep in the wild wilderness of deep canyons and dry washes during the day, and sit at a casino buffet in Laughlin for dinner. Should you opt for wilderness and swing on a hook in a lonely cove amidst the wild, avoiding those beckoning tables and piles of food, you still can't get away - the bright lights of Las Vegas create a glow to the north, and a similar shine brightens the night sky to the south over Laughlin. Why, even the name is a contrast. The Spaniards called the desert area Mojave, the natives call it Mojave, even some towns are named Mojave - but the National Park Service calls the lake - Mohave. Now, it would be nice to blame the misspelling on the inability of eastern politicos who can't pronounce Spanish, but they aren't to blame. 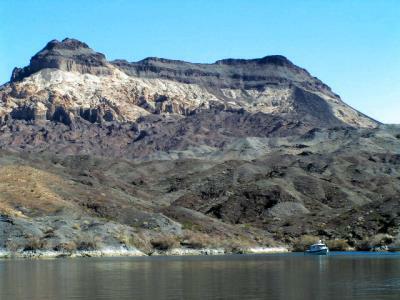 Nevada's own senator, Sen. Bible, named the lake, Mohave, in the enabling legislation for the expansion of the Lake Mead National Recreation area. He knew it was Mojave, but apparently thought it would be easier to give the name a phonetic pronunciation after hearing those eastern dudes mispronounce Mojave. Nevadans are a stubborn breed, though, without much respect for those in Washington, DC, so most still write the name Mojave (just as we still call Boulder Dam, Boulder Dam - not the name of some politician, Hoover). 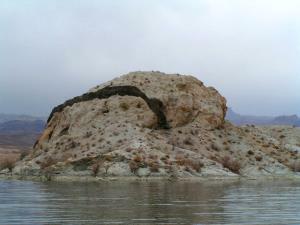 Another important incongruity for boaters on Lake Mojave is the amazing geologic contrast. 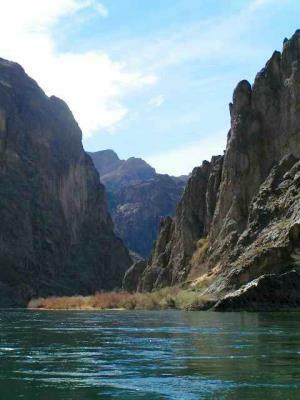 As you cruise upriver from Davis Dam, you pass next to a high mountain mass, the mountain sacred to natives, Spirit Mountain. It is the spire crowning the Newberry Mountains, a huge mass of light-colored rocks, deeply incised by canyons (that make marvelous anchorages). 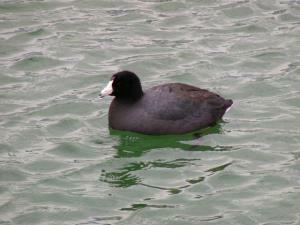 Farther north, the lake spreads out into a broad basin edged by sloping gravel. 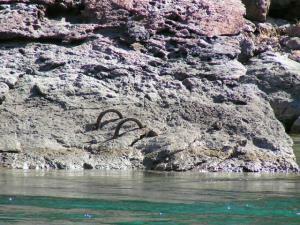 Then, above Cottonwood Landing, you cruise into the depths of a beautiful, rugged canyon. 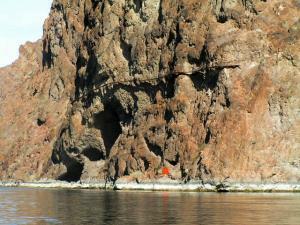 Rock walls tower above the water and you enter a glory of sheer rock and steep side-canyons. Geologists have been scrambling over those rocks scratching their heads for a hundred years - some searching for mineral wealth (and finding it) and others trying to decipher the clues left behind in the rock. 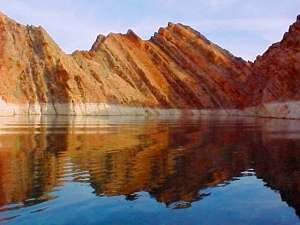 The colorful rocks that make the setting of Lake Mojave contain fragments of geologic history that date back over two billion years; nearly half of the Earth's almost 5 billion-year history. There are amazing tales of continental collision, crustal stretching and rupturing, volcanic eruptions, and carving of the land by water. First of all, we have a serious problem with The Mystery of Mojave. Most of the first 300 (3 b.y) of the 500 pages are gone, and the fragments that remain are poorly numbered and smudged. Some novel! We literally got ripped off! We're over half way in the book, and we haven't read a clear word yet! 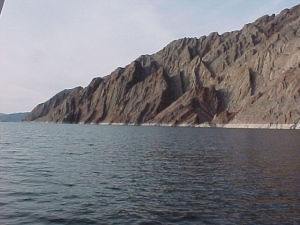 We can figure out that the setting is present-day Lake Mojave, in Nevada-Arizona. On page 300, we can see that the scene then is much different than today --all was then ocean - deep ocean. Far off on the horizon, on a clear day, we might just be able to see one of the characters - the North American continent. We turn a few pages, and the few legible words talk about another character - an Island Arc. This character is crowned by lofty, smoking volcanoes in the opposite direction from North America. The vague description makes the Island Arc look similar to an offshore view of Japan, today. We turn more pages, with indistinct smudgy words. We get the idea that the Island Arc is approaching North America and finally, on page 330 (1.7 b.y. ), there are scattered words that imply that the Island Arc has smashed into the continent. The arc has been riding atop a moving veneer of crust, a plate. The oceanic part of that plate plunged under North America, when it wasn't looking, but the high islands of the arc crushed against North America and welded itself to the unsuspecting continent. Our Mystery of Mojave is now taking place with one main character, North America - and the scene is now on that accreted volcanic island arc. The force of the impact was enormous, even though the colliding movement of the arc was slower than the growth of your hair. But imagine the masses involved! - like two sumo wrestlers in collision. The incredible heat and pressure of the impact baked the volcanic rock, the shoreline beaches, and the whole margin of North America, into a hard mass of recrystallized rock - metamorphic rock. 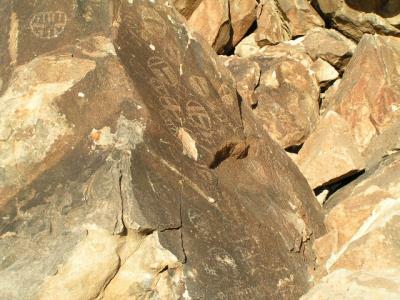 The evidence of this crime is still to be found in the walls bordering Lake Mojave. Page 330 - Ancient Rocks Smashed, Baked, and Contorted by Collision! Nothing much is legible in the next 30 pages, but on page 360 (1.4 b.y) there are some clear words about a new event in the mystery. The baked metamorphic 'country rock' was heaved upward and intruded by molten magma. There are clues left behind of this violent intrusion - the metamorphic rock is scarred and seamed by solid granite. The next 138 (1.38 b.y) pages are torn out. Gone!! Not much of a story - so far, most of the pages are missing. Those that remain are mostly smudged. Only a few have legible words - and we're on page 499 - only two pages left to go! 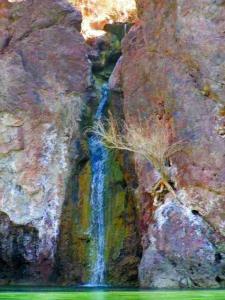 Book reviewers of The Mystery of Mojave have termed all these lost 138 pages, The Great Unconformity. No one knows the story once written on those missing pages - it is a mystery within a mystery. The reviewers say there are clues, however, in the geologic story of the Grand Canyon. It is assumed that the destruction of the Mojave pages was caused by uplift along the continental margin of North America. Land, anything, that lies above sea level is eventually worn away. Erosion tore away the rocks on the land surface. Long-ago rain storms washed the detritus to the nearby ocean. So, we think the continental margin of North America was planed off to a nearly flat surface, with a few gently rolling hills. There are, however, no credible witnesses. 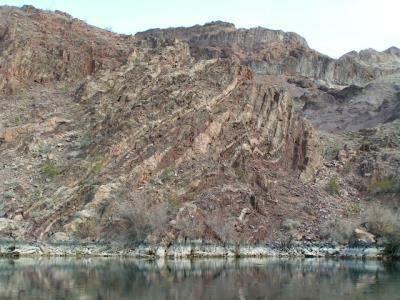 The Great Unconformity: Almost 1.5 Billion Years of Earth History Gone! Recent Volcanic Ash Lying on the Ancient Metamorphic Rocks. So we pull off another book from the geologic shelf - Underground at Mead - a Cliff-hanger for Geologists. This tale is also about long-ago events and is also 500 pages long. 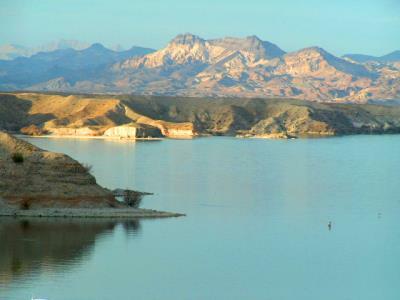 From page 1 to page 360 the story is identical with The Mystery of Mojave (mostly missing pages), but the Lake Mead story has 44 (560 m.y.) pages left at the end of the book, 42 more than Mojave. So, we start on page 456 in the Mead book and read a legible tale. Our main character, North America, is now located south of the equator, surrounded by warm tropical seas. The next four pages tell of the slow advance of the warm-water ocean over what is now Lake Mead (and by proximity, probably Lake Mojave.) By page 460, life teemed in the warm sea and zillions of chalky skeletons sunk to the bottom of the sea, eventually changing into limestone. 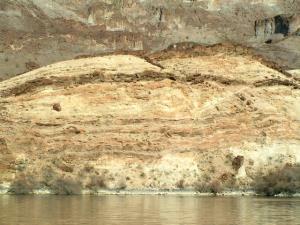 The land sunk at about the same rate as the sediment piled up (maybe the weight of the sediment sunk the land? ), so the sea remained shallow. More than 6,000 feet of limy material was deposited. As we continue reading the pages, the sea comes and goes. For short times, when the sea is gone, sand and mud from near-shore dunes and rivers layered between the marine limestone. Other times, erosion stripped out paragraphs and even pages from the record. Finally, on page 474 (260 m.y. ago), the sea withdrew for good. Seems there was another colossal continental collision - this time North America smashed into Africa and South America! The collision lifted North America above sea level, and wrinkled up mountains as close to Mojave as Colorado and New Mexico. Erosion from rivers flowing down these ancestral Rocky Mountains spread a veneer of sand and mud across the Mead (and probably Mojave) region. 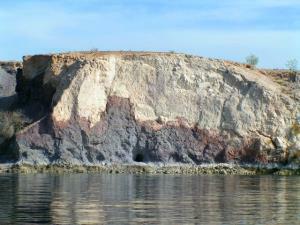 These beds are characteristically red-colored from rusting iron in the sediments. Some of the turning pages tell stories of dune fields as large as today's Sahara covering the southwest. This takes us up to page 493 (70 m.y. ago). With only seven pages to go, the Pacific Place began shoving North America easterly. The continent resisted, and its crust cracked. Huge crustal slabs ruptured and over-rode each other, shifting to the east. 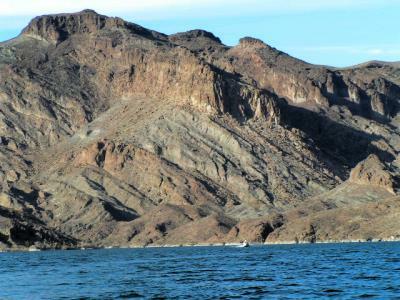 Some slabs over-rode the Lake Mead region. Dinosaurs walked on those slabs. The next five pages of the Mead story are missing - probably torn out by that old thief, erosion. From here to the end of the stories, the Mead tale and The Mystery of Mojave, are identical. The last two pages 499 (18 m.y. ago) and 500, in each book are distinct and clearly readable, although burned around the edges. Their story can be summed up in one word - searing chaos!! It is a tale of volcanic upheavals. Huge volcanoes explode. Ash, lava flows, shattered rocks blanket thousands of square miles. Some magma, forcing upward toward the surface, fail to make it and cool underground as huge masses of granite. Those last pages also describe heaving and shattering of the crust. It is upbowed and fractured - puntuated by volcanic blasts. The stretched crust cracks and huge blocks shift down creating deep basins. Adjacent blocks, tilt to crazy angles, forming rugged mountains. On the last page (last 10 m.y. 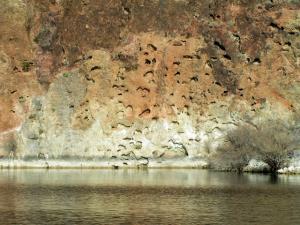 ), the crust had stretched so thin that deep, sticky magmas, iron-rich and black (basalt), poured across the land. That last page has 10 paragraphs (each representing a million years), and the chaos continued until the last two paragraphs of our 500-page book, then, for a Hollywood ending, things slowly calm down until the last sentence is relatively serene. Fortunately, the tale ends in relative quiescence, since humans arrive on the scene. The final dot - the period at the end of The Mystery of Mohave - records the first folks walking into the story, and looking around with amazement at this incredible landscape. 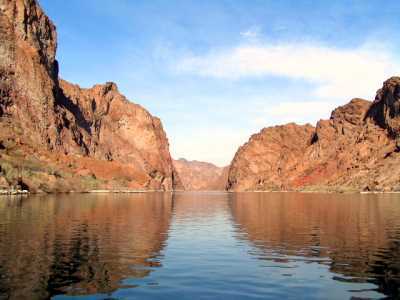 There is another brief tale - that of the Colorado River. With all the chaos written on the last two pages, the river had a real challenge to find its way across a landscape of belching volcanoes, uplifting mountain blocks, and floods of basaltic lava. 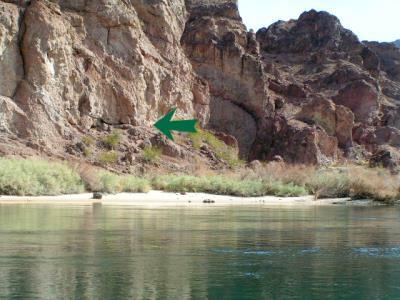 Why would the River choose such an improbable path through Black Canyon in Lake Mojave? The best answer seems to be that the river is following an old course, maybe five hundred feet higher than today's river. In the last half page, the land rose slowly upward forcing the river to cut down to keep its course. Finally, lava flows and uplifting mountains prevented the river from following any other path, so as the land continued to rise the river had no choice but to continue cutting down, now through the dense metamorphic rock of Black Canyon. So, in a sense, the river didn't cut down - it stayed at the same elevation and the land rose around it. Whew - what a tale, The Mystery of the Mojave. Hard to piece it together, so much is missing. And, most of the clues come from surrounding regions, so are a little suspect. But the evidence left behind can be reconstructed into a fascinating geologic story - reconfirming the idea that facts are stranger than fiction!